I’ve been thinking about doing this series for a while now. 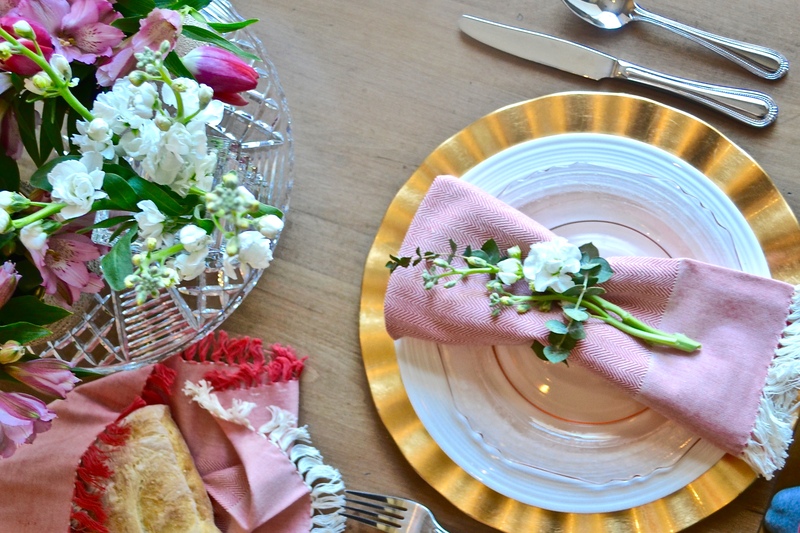 Here’s the deal – I absolutely LOVE tablescapes in all shapes and sizes. 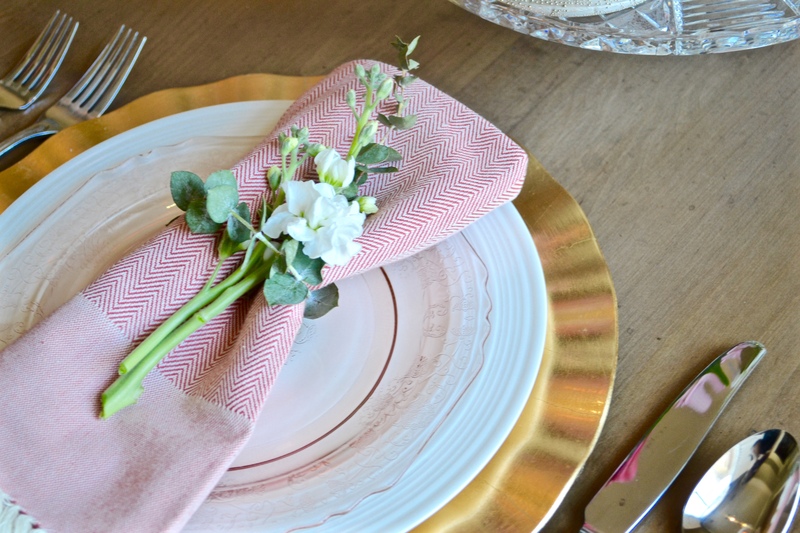 All of my favorite things: linens, flowers, dishes (I come from a family of dish hoarders…seriously…ask my mom…it’s an addiction), pretty papers and crafts and need I mention FOOD?! All in one place just waiting for my favorite people to enjoy them. What could be better? Ok, a baby giggle but she can come to the table too…just not on Valentine’s date night. Where to start? 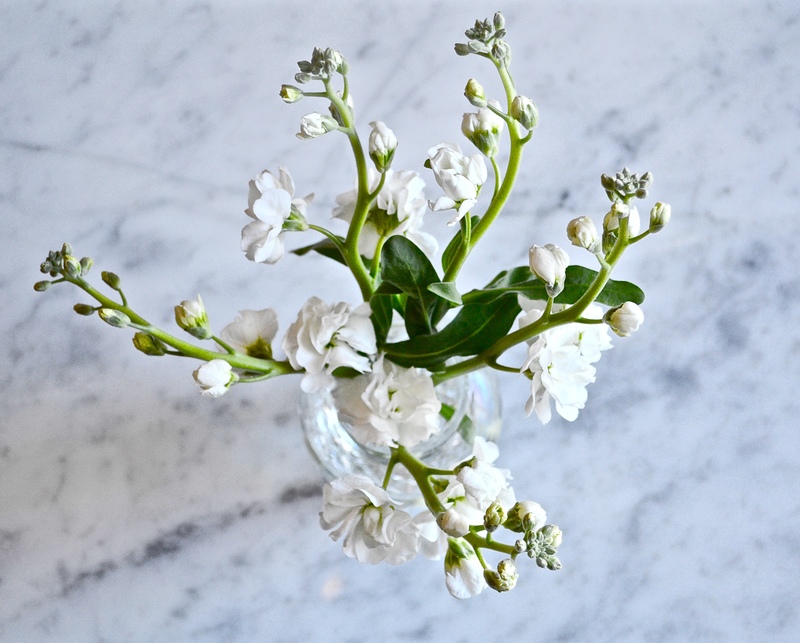 Most of the time when doing tablescapes I don’t start with the flowers…but these flowers were just calling my name at Trader Joe’s so I went with it. I just snagged one bunch of all of these – under $15! 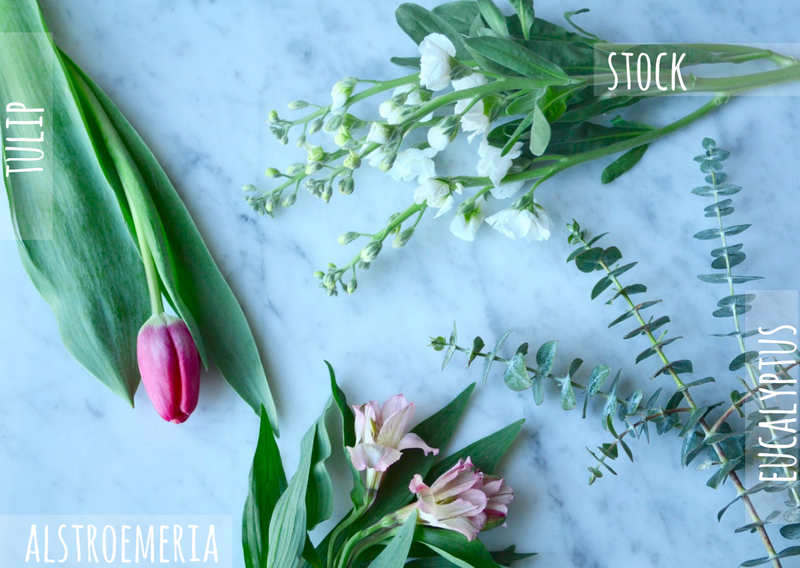 The important thing to me when choosing flowers is obviously getting colors and styles that compliment each other but also making sure to get a variety of greenery. 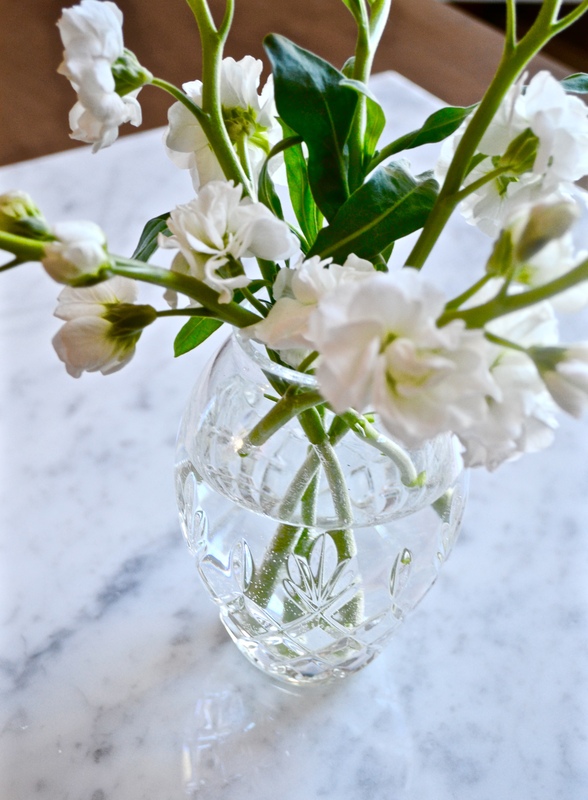 Look at the leaves on what you’re getting – do they stay close to the stem or come out a bit? Depending on the style you’re going for, it helps to have at least one bunch with some bulk to it. This helps to fill out arrangements. I didn’t end up using the eucalyptus in my flower arrangements (they served useful for something else!) but it’s a great one to have on hand for filling things out or adding some height. 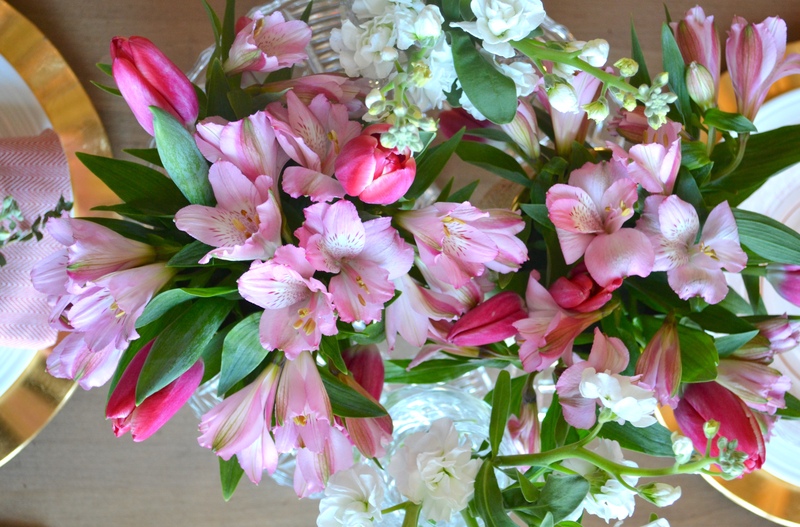 I chose to keep these arrangements pretty small (and short) given that it would be the centerpiece. Generally you want to see the person sitting across from you…especially on Valentine’s Day. 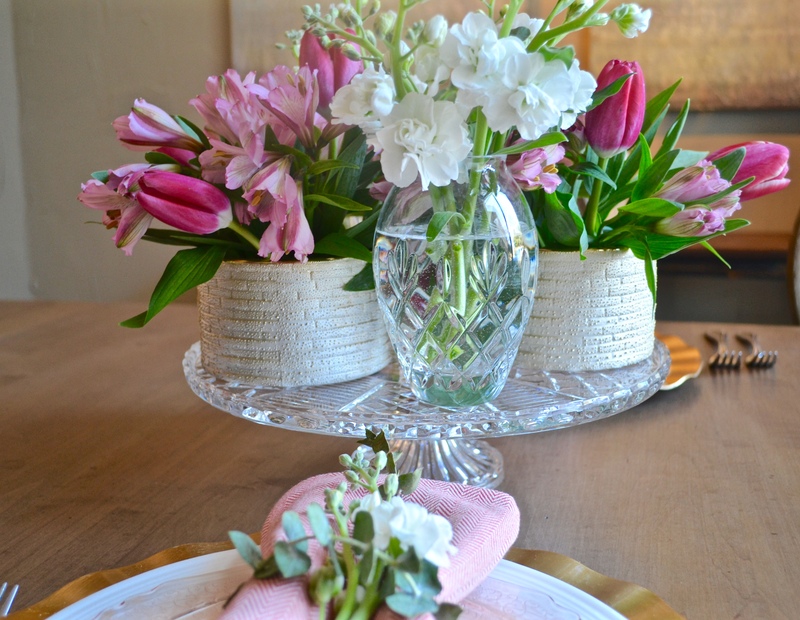 This beautiful little Waterford vase was a hostess gift from some good friends when we hosted their baby shower (check the super cute shower out at C is for Carnival!). I used another bud vase we had on hand for a second stock arrangement. 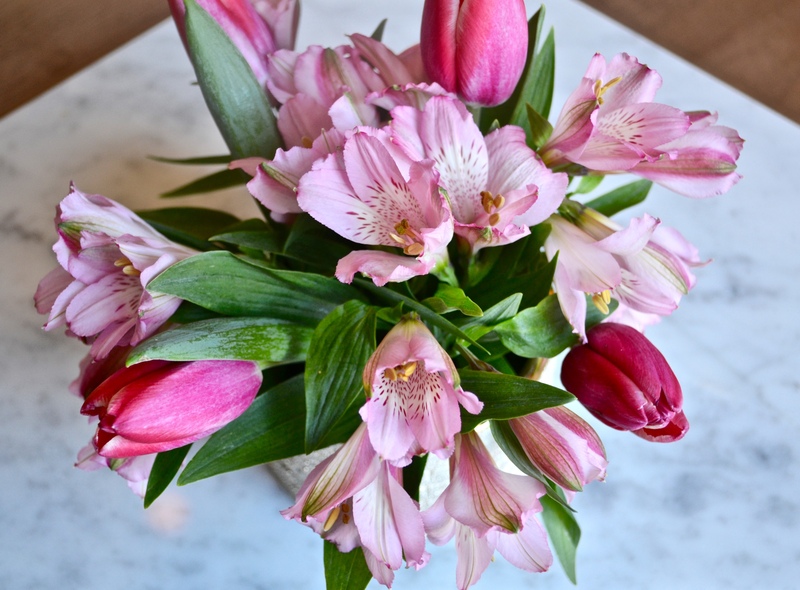 The tulips and alstroemeria stuck together – see how the leaves of the alstro fill the arrangement out? I used some wet flower foam here to help the flowers stay where I wanted them. 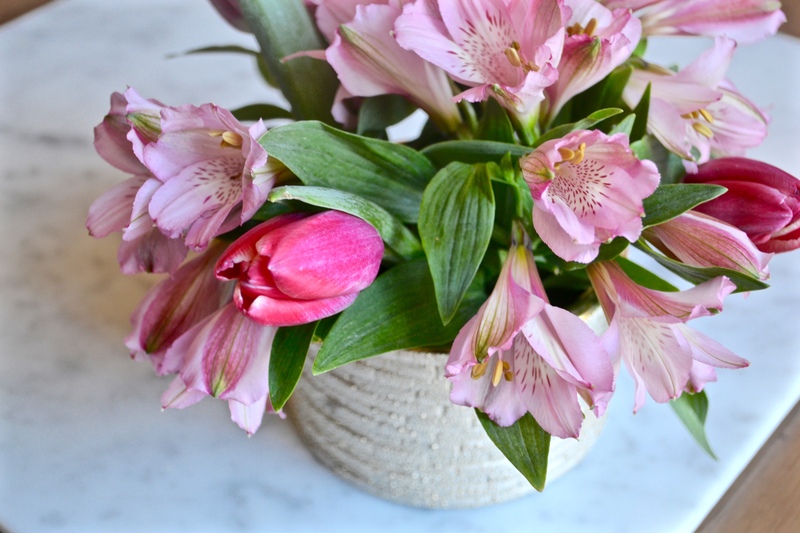 The tulips in particular need to be handled gently as their stems are not as sturdy so dainty hands! 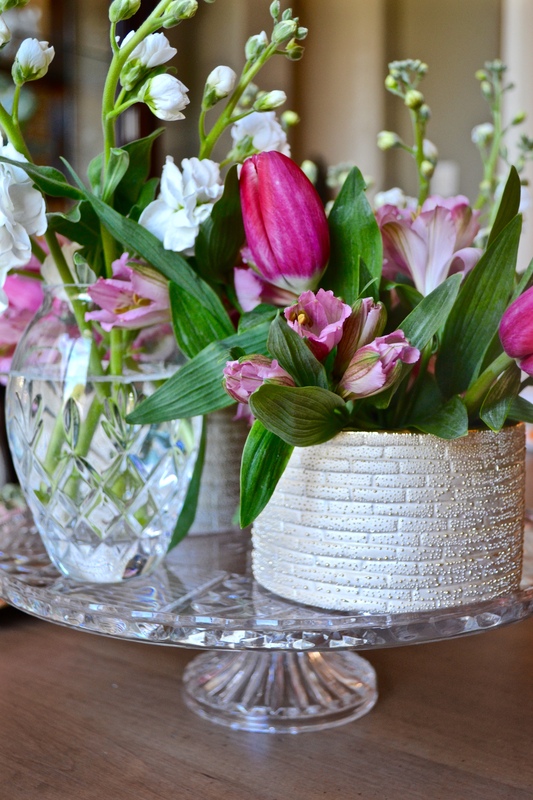 With a total of four small arrangements, I brought them together by placing on a low, crystal cake stand. If you’re creating this look be sure when you sit down you can still see across the table. Had I not been able to I would’ve opted to not use the cake stand. 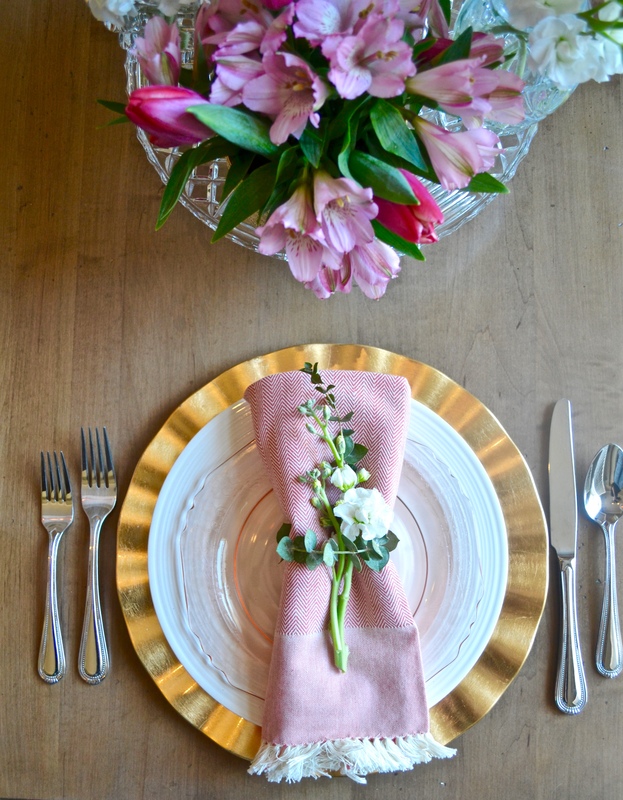 I had plenty of leftover flowers to do a little accent on the napkins – this is where the eucalyptus came in. 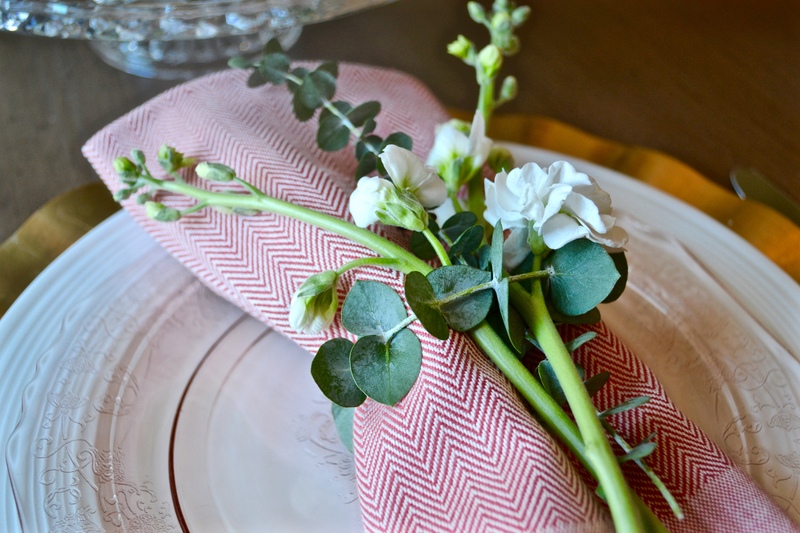 By using the thinner pieces at the end, I was able to wrap them around the napkin and do a little tuck on the underside. No extra wire or fastener needed. Ok, now is where I stop talking and let you just take it all in – ready? And go! 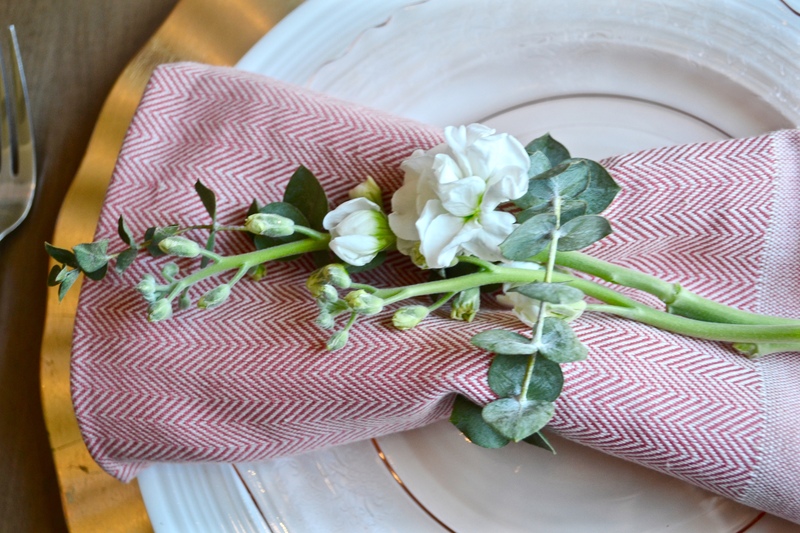 Hope you enjoyed the first of my Table for Two series! 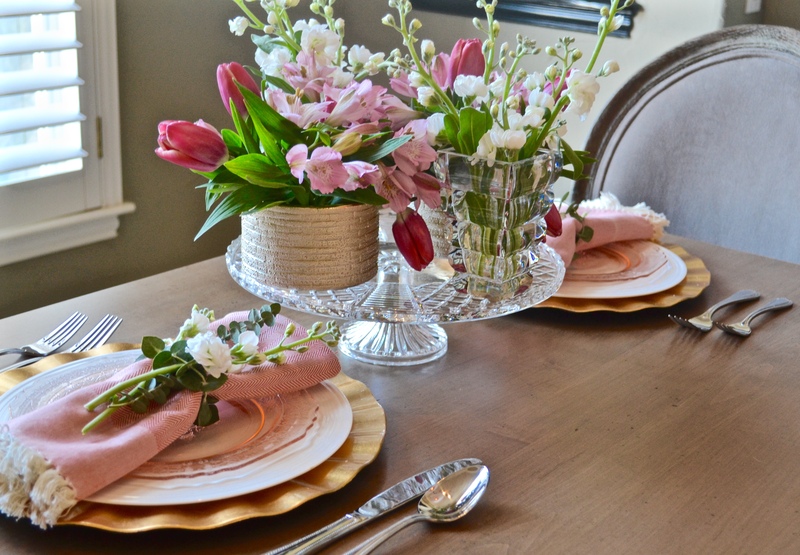 To see other tablescapes I’ve created CLICK HERE. This made my day! 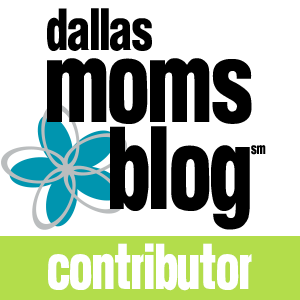 Thank you for sharing your thoughts and I’m glad you like it! 😊 Hope you have a magical Vday! Dates nights are challenging and take some thought but are so necessary and fun! Great post. Thank you so much Linda! Happy Early Valentine’s Day to you!